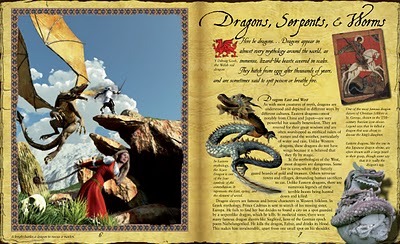 An Illustrated Guide to Mythical Creatures is written by Anita Ganeri and illustrated by David West. 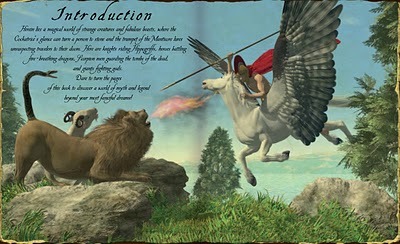 It’s a rather attractive hardcover book for children ages 9 to 12 that is exactly what is described by the title – a reference to various figures and types of creatures from mythology containing many 3D computer generated graphics. Each of these generalized categories is then divided into several more specific types of creatures, most of which just have a paragraph describing them. Every page is laid out very nicely with lots of pictures to go with the different descriptions, and the beginning of each new chapter has a full page image to go with it. An Illustrated Guide to Mythical Creatures is a great book for introducing children to world mythologies. It’s keeps each explanation fairly short and to the point and provides many pictorial examples of what the various creatures look like. Where I got my reading copy: A publicist sent me a copy.